My annual pilgrimage to the Perth Writers’ Festival is over for another year. According to reports, I was joined by 38,500 other reading and writing fans, with ticket sales up on last year (can someone confirm that figure, I thought I read it here but I must have been mistaken. Edit: confirmed figure from WritingWA). Some write-ups have discussed the heat; we are 1.6 degrees hotter than the long-term average for February: thanks climate change! Some write-ups have discussed the wonderful talks from literary authors; can’t be less entertaining than their books. Some write-ups have tried to imply that Perth people gasped when Scott Ludlam used the word crap; yes we clearly are a simple folk over here in the west, not accustomed to swearing and impolite behaviour like taking notes. So I hereby present my write-up. 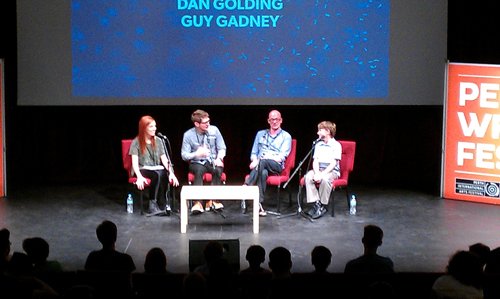 I started off my festival adventure with the panel discussion Tinker, Tailor, Soldier, Spy. Susan May chaired a discussion on writing, publishing, and thrilling books with Chris Allen and Joe Ducie. It was an interesting session, although Joe is not what you’d call a gregarious person and he is limited in what he can say without being sent to a black site for breaking the secrets act. This session attracted a lot of teen readers, a first for any writers’ festival I’ve been to, in part due to the young adult theme of Joe’s book and Chris’ campaign to get more boys reading. Also, why is it that the nice and friendly people always seem to write the books with the largest body counts? My plans for the day were beaten with a cricket bat when the session Fair Go Mate was filled past standing room only. Not being able to gain admittance I’m going to say the session was clearly for doo-doo heads. Instead, I went and saw The Inner Life of Others. Amanda Curtin discussed building and writing characters with Debra Adelaide, Chris Womersley, and Andrea Goldsmith. I was sitting next to the fan for one of the much-needed air conditioners for this session. So while I was quite cool and sweat free, I couldn’t hear the speakers clearly. I think in future the festival need monitors for the speakers or better technicians on hand to get the sound levels right. I had hoped to see the session Boom Town Rats in the afternoon, as David Whish-Wilson was speaking. He wrote my favourite novel of 2013 after-all. I had to settle for asking him how things went via Facebook: apparently, it was an interesting discussion session. Instead, I went to Annabel Smith’s workshop on Social Media Marketing. Annabel discussed various aspects of social media and the Hub and Outpost model, with your blog/website being the hub. We had a range of people in the room from social media novices to professionals, and a couple of people who didn’t see the point – I mean, being able to talk and form communities with people on the other side of the planet instantly is so overrated. Annabel did well in catering to such a wide spectrum. Lee Battersby’s fantasy writing workshop, Universal Law, kicked off my Saturday with a teddy bear explaining humans to aliens (you had to be there). This was a fantastic session and I got a lot out of it. Okay, that could just be confirmation bias talking, because Lee did confirm a lot of my own thoughts on fantasy and fiction writing in general, but I’m just going to pretend we’re both right. Plus, I’ve got the beginnings of a cool little absurdist short story from the session, which may have made the session pay for itself. Hungry and in need of golden ale refreshments, I headed to the UWA Club. David Marr was holding court with a throng of fans/questioners/listeners after having finished his discussion panel. I was tempted to join the group and ask him when he was going to finally stab Andrew Bolt to death for crimes against journalism, but decided to not ruin his day. After a leisurely lunch at the UWA Club, I skipped the next beer and went to The Game Changers: What’s In Store? Stephanie “Hex” Bendixsen chaired a fascinating discussion about the games industry and storytelling. Dan Golding, Dan Pinchback, and Guy Gadney were all insightful speakers and kept the audience of preteens to curmudgeons entertained. Guy Gadney also showed a quick wit when a young lad couldn’t remember Guy’s name, with the boy ending up on stage answering questions (which he handled quite well). Although, as if to prove that the games industry has a long way to go, or that men are still dickheads, one of the audience members started his question with “Damn girl, you fine!” when addressing Hex. If there was only some way to breed this behaviour out of the population…. The next session I attended was Hi-Viz Days with author and comedian Xavier “Matty” Toby. As a general rule, I don’t read non-fiction, as it is often more fiction than non-fiction, is often boring, and has far too low a body count to be entertaining for me. But having attended this session and listened to Xavier read out some sections from the book, I would recommend you read his book about his mining experiences. Having lived in rural Australia for a large chunk of my life, a lot of the conversations, the style of speech, and the characters portrayed sounded like the people I’ve met and know. A few award winning authors should read Xavier’s book to see how rural and regional people actually speak (or at least hand back the awards for capturing the ‘bush lyricism’ in their novels). My Sunday started rather early. Or rather, my Saturday didn’t really finish until Sunday morning. My little bundle of joy was ill and had trouble sleeping, which meant I did too. It also meant I’ve contracted his illness: parenting is lots of fun. I’d already missed one of David Whish-Wilson’s sessions on the Friday, but I went the whole hog and missed his Sunday session as well. His interview on Perth, the city, and his non-crime, non-fiction book, on Sunday apparently went well (full house). David assured me that there were plenty of interviews being done around the festival on this book. Which means if we check his webpage we could probably track down an interview with David on Perth; the book and the city. The only event I managed to attend on Sunday was Susan May’s workshop on Standing Out From the Crowd. It turns out that Susan and I had been in the same all day workshop on publishing a few Perth Writers’ Festivals ago. Her takeaway from that event had been to avoid the slush pile and somewhere along the way, after developing industry contacts to help avoid the slush pile, she self-published. I agree with one of the other attendees that Susan’s session was enthusiastic and genuine. And that concludes my Perth Writers’ Festival adventure for another year. It was good to catch up with friends and other attendees over the three days and I hope others enjoyed the event as much as I did. Hi Tyson – moving one stage further, can I link to the photo of the stage and reference your summary. Was a great fun session! Sure. Linking is all I ask. I just wish my phone handled low light a bit better so that the focus was better. And the fun aspects also hid the fact that it was highly informative, interesting, and scoping. Would have liked to have seen the whole series. Thanks for your write-up here about the Game Changers session. No probs. I just wish I’d been able to attend all the sessions. I can’t claim to be a gamer but I’m always interested in the medium. Next Next post: Is fiction actually fiction?